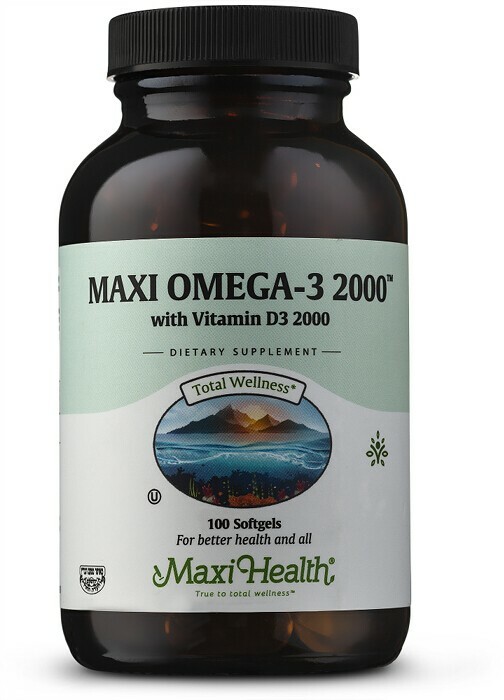 Maxi Health is proud to provide you with “Maxi Omega 3 2000™ with vitamin D3 2000”. It's fish oil and vitamin D3 encapsulated in a kosher, soft gel. Certified Kosher by Bedatz Eida Chareidis, Orthodox Union (OU), and Udvari Kosher. You keep reading and hearing about the benefits of essential fats, the omega-3 fatty acids; eicosatetraenoic acid (EPA), docosahexaenoic acid (DHA). You’ve heard and read how it supports the brain, the eyes, joints, mood, memory, and heart. Remember, it’s the Omega-3’s that most people are deficient in, not Omega-6. Don’t leave Omega-3 levels to chance! Vitamin D3 supports calcium absorption in the gut and mineralization of bones. It also supports modulation of neuromuscular control and reduction of inflammation. Vitamin D3 is the most bioavailable form of vitamin D. Now you can take 2000 IU per serving when you take your fish oil! Take your Maxi our Omega 3 2000™ with Vitamin D3 2000 every day. Contains Kosher approved fish (Anchovy). This product contains NO wheat, gluten, yeast, salt, sugar, milk, artificial flavors, colorings or preservatives.